This medium duty scour pad can help you wash dishes with ease! It is a general purpose cleaning pad designed for daily cleaning of pots, pans, utensils, equipment, and floors. The scrubbing pad is great for cleaning fresh vegetables, but not recommended for use on certain soft plastics, fine china, or polished stainless steel. 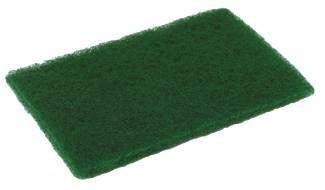 Â The ideal scouring pad for any kitchen!